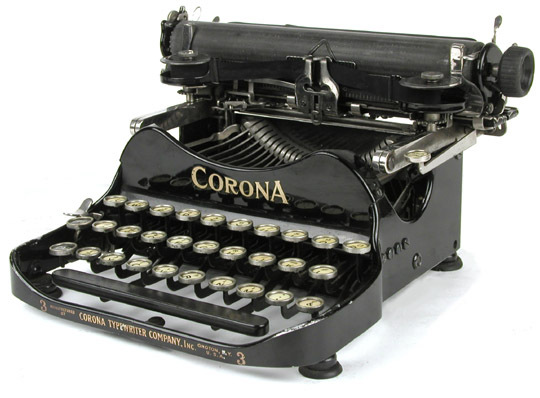 Once declared by Hemingway as the only psychiatrist he would ever submit to, the Corona No. 3 was an instant success when it debuted in 1912. Based on the Standard Folding Model of 1906, the No.3 was refined in this even lighter and more compact machine made mostly from aluminum. The No. 3 has three banks of keys and a double carriage shift: one for capitals and the other for figures. Another unique feature in the typewriters design is the machine's ability to "fold" in order to fit into the case -- that is, the carriage was hinged and could tuck forward over the keyboard and become more compact for storage. This machine was so practical that it was chosen by British Army in WWI. Over 700,000 of these machines were produced and the production lasted nearly 30 years. With a nice tidy 3-row folding keyboard, early models had only one shift key on the left side of the keyboard (as shown) while the improved versions had a shift key on both side of the keyboard. Other variations include the Special models in the later 20s, which came in a series of attractive colors: red, green, blue and gold.